In the first few installments of this commentary, I propose Architecture is (by definition) a political act and an essential strategic element of business. Within the corporate cubicles, whether as employees or as creative consultants, user experience professionals advocate for users—their agendas, their needs and their emotional experiences. We promote users’ needs up the food chain until they are a strategic element of the organization. Many organizations have reaped the benefits of integrating users experience into their offerings. There are many many more which have not. User Experience strategy and architecture is not achieved solely through visual treatments or updated content. It is not a compromise with doing “business”, or a trade-off with good system design. As professionals, we fail in our responsibilities to the customers (ostensibly the most important people in the business) when we fail to integrate UX into heart and soul of the organization. Our challenge as UX architects is not just delivering a solid experience; our challenge is promoting users’ experiences by baking them into the core of the organization. In this article, I shift focus a little bit. Here I begin to tease apart Architecture from other forms of design. Let’s take a moment to imagine a rich fantasy: we’re working for an organization that has invested in UX exactly as I describe above. We’re spending our time profitably solving user experience issues and not trying to convince our peers and leadership about UX’s value or purpose. What a sweet dream! Now we can focus our attention on developing a sustainable process of creating those experiences—we now turn our attention to crafting a UX architecture. UX architecture is more than simply defining a user experience. User Experience architecture is more than defining a user experience: it establishes a sustainable process of designing user experiences. Designing a user experience is the job of a designer; creating a process of designing user experiences is the job of an architect. Creating a sustainable process that drives ongoing business is a strategic process of the organization. User experience design attains the status of architecture when it takes a seat at the strategy table. When the organization is in the business of delivering differentiated user experiences, it must establish an ongoing, sustainable process (frameworks, job roles, etc.) to generate these offerings. That’s part of a UX architecture. In Nathan Shedroff’s presentation to CHIFOO in October, 2008, he provided a diagram illustrating his vision for a sustainable process of product development. The diagram works equally well to explain user experience design, applied at the strategic level of the business, transforming into user experience architecture. On the left side of the figure, the business spends time and resources figuring out its game plan. 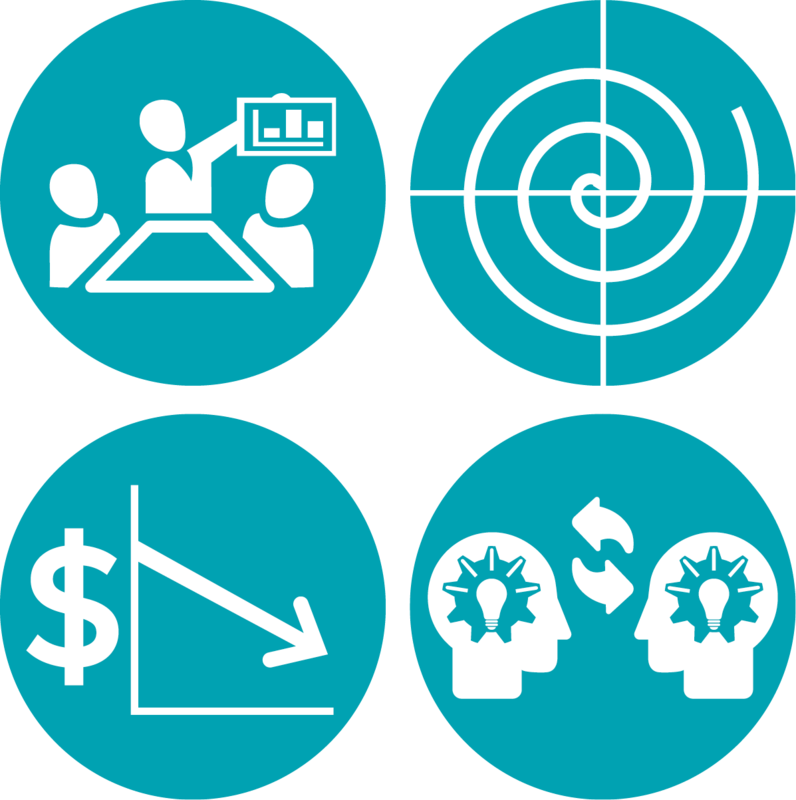 With a plan (strategy) in place, the business divides up resources, assigns tasks and gets down to doing its business thing, indicated on the right side of the figure. In Shedroff’s view, user experience, engineering and business must all work together on both corporate strategy and implementation to provide a sustainable development process. On the left side of the diagram the organization focuses on the problem it’s trying to solve. On the right side, the organization iterates on the solution. For many organizations, “design” is not a well understood discipline. For others, design is considered a function of product development. Recently, “design thinking” has become popular in the C-suite as a way of thinking differently about business. This is an excellent evolution, but all too often the strategy and execution pieces are not tied together. Upper management has been introduced to design thinking in the context of organizational strategy, but those results don’t connect with design work going on at the project level. When design is only positioned on the right side of the diagram, it competes for resources with other development functions. In that “implementation” context, with little connection to the larger strategy, design’s role may be reduced to styling or surface treatment. In the worst of circumstances, management eliminates design from the development effort to reduce costs or shave time to market. On the flip side, organizations that invest in design at the strategic level are positioned to respond to “game-changing” shifts in their offerings. User experience design on the left side of the diagram offers management an opportunity to consider a wide range of possible futures. But that outcome isn’t guaranteed. In the “strategic” context (the “fuzzy front end”), design may only make things fuzzier. In the worst of circumstances, design at the strategic level is a distraction, leading to little progress: the C-suite may generate lots of divergent ideas that never get molded into actual products and services. 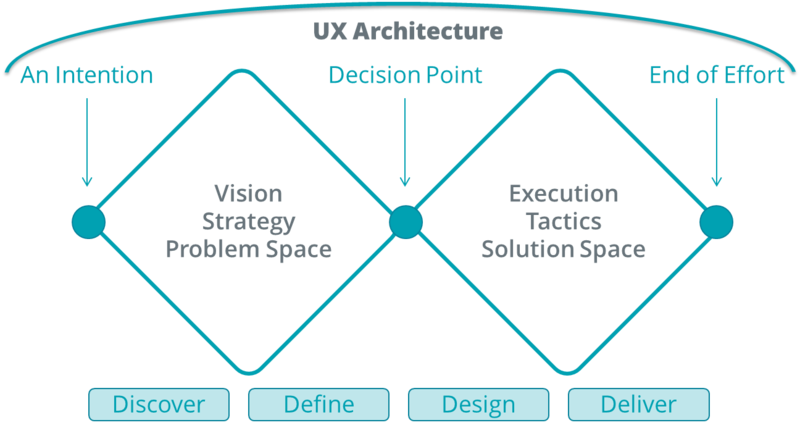 UX architecture defines an end-to-end framework with its feet firmly planted on both sides of the diagram. On the strategic side, UX architecture offers strategists an intimate view of their users with intriguing opportunities for differentiation and innovation. On the implementation side, it provides product teams a structural framework in line with the company’s strategic goals. Equally important, a well defined UX architecture (as a set of deliverables, not just as a process) enables consistency across projects, promoting branding goals and opportunities. In addition, a UX architectural framework provides a communication conduit for team members on both sides of the diagram. Designers, engineers and marketing planners can discuss user experience discoveries made during the course of development with strategists; similarly business and product managers can communicate shifts in strategy to the implementation teams, including impacts on users (and by inference, impacts on the design of products or services). Leaders in user experience share this view. In the book “Subject to Change”, Adaptive Path’s Peter Merholz et. al., discuss UX in much of these same terms. They describe both a UX strategy (having a strategy for designing user experiences) and incorporating UX into the business strategy. As they put it, UX design is a means of “creating a long Wow!”, an ongoing process of maintaining customer loyalty, not through some artificial loyalty program, but through the consistent and continual release of stellar experiences. In the next installment, I offer another aspect of UX architecture fundamental to an organization’s strategy: The UX Vision.